For over 20 years, VeeRonna has wooed thousands of listeners of all ages and tastes with the excitement of her music and the aesthetic beauty of her instrument— a mahogany carved concert grand harp. Her professional expertise and musical excellence will help foster an extraordinary atmosphere for your event. You’ll appreciate her insight, and of course, requests are always encouraged. Perhaps what distinguishes VeeRonna from others is the attention she gives to you from beginning to end and the music itself. She is well-known for creating beautiful, luxurious music that is tailored exclusively for you, your family and your friends. She specializes in playing familiar upbeat Pop, Latin, and Jazz pieces. The result is a memorable and magical experience for everyone present. 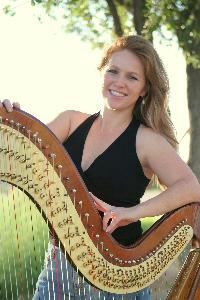 If you haven't already done so, we invite you to visit her website http://www.vharp.com for more information about VeeRonna and to listen to music samples in Playlists and/or Weddings.